Turkey offers scholarships to international students from all over the world to study in the most prestigious universities in Turkey. ** Students already registered in Turkish universities at the level of study they are applying for. Applications can only be made individually through official website by the candidates. There are no institutions or persons authorized to apply for Türkiye Scholarships. 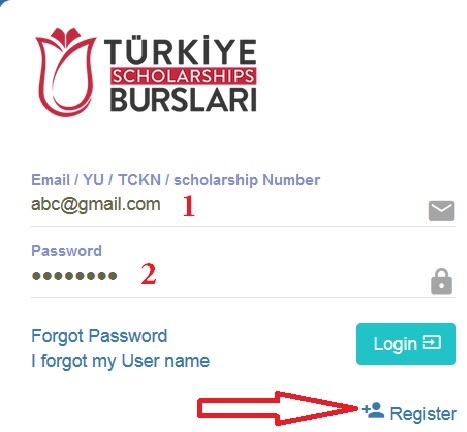 Step 1 : Go to the official website of Turkiye Scholarships provided above. Step 2 : Next read the instructions carefully and click on “Apply Now” link in that page. Step 4 : Signing up is free of charge and will take approximately 2 minutes. Signing up only once will be sufficient. Step 5 : Click on the “Register” link and fill the required details to complete the registration. ** Candidates are strongly advised to carefully read the instructions and warnings in the application system. ** Applicants are required to submit and upload the necessary documents to the application system. ** Applications delivered by post, courier, or by hand will not be accepted. ** Applications are free of charge. Please do not entertain any third party institutions or persons who offer to make an application on behalf of you in exchange for a fee. Turkiye Scholarships applications for 2019 will be received in one period, and applications will be open between 15th January- 20th February 2019 for international students from all countries. I AM A NEW INTERNATIONAL APPLICANT. I WANTED TO REGISTER SO I FILLED ALL REQUIRED PERSONAL INFORMATION. BUT THERE WAS A PROBLEM WITH THE VERIFICATION CODE. CAN ANY ONE HELP ME THE FREQUENT NUMBER FOR VERIFICATION CODES BECAUSE IT IS COMING WITH REPETITIONS AND I AM STILL NOT REGISTERED.